It’s been said that music is food for the soul. Where some believe this is simply a saying, others such as music therapists, have proved this saying to be true. According to the American Music Therapy Association, research in music therapy supports its effectiveness in many areas such as: overall physical rehabilitation and facilitating movement, increasing people’s motivation to become engaged in their treatment, and provides emotional support for clients and their families, as well as an outlet for expression of feelings. The Children’s Center Rehabilitation Hospital employs a group of dedicated music therapists who use instruments and music to assist in the rehabilitation of their patients, providing individual and group music therapy sessions to all inpatients throughout the hospital. Each patient has a set plan of care with specific goals they are working on during their music therapy sessions. Music therapy is the only sensory experience that can activate all areas of the brain at the same time simultaneously. In addition, research shows that using a patient’s music preference is most effective in music therapy sessions. 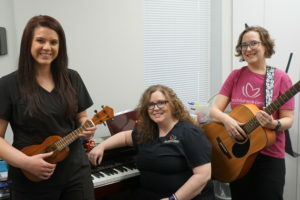 “In the pediatric medical rehabilitation unit, I might work with a patient regaining the ability to talk by singing familiar songs with them,” said Rachel Nowels, director, music therapy. Where music can help calm an over-stimulated child, and bring words to a child whose having trouble communicating, the beauty of music can also play a part in physical recovery. “Music can be used to help work on coordination. For example, we might work on coordination of the arms or legs by using the steady beat of a motivating song,” said Nowels. The benefits of music are many, including the foundation of special friendships. “I love building relationships through music. We use our patients’ passion for music as motivation to reach their goals,” said Alex Robinson, music therapist. Music therapists may be the ones giving the gift of music, but they are also receiving a gift in return. “I love getting to facilitating my patients’ progress toward their goals and improving their quality of life. It’s fun when they are successful in my sessions. I see them be proud of themselves. It is very rewarding to me,” said Jennifer Schafer, music therapist. To learn more about the programs and services at The Children’s Center Rehabilitation Hospital, please click here.